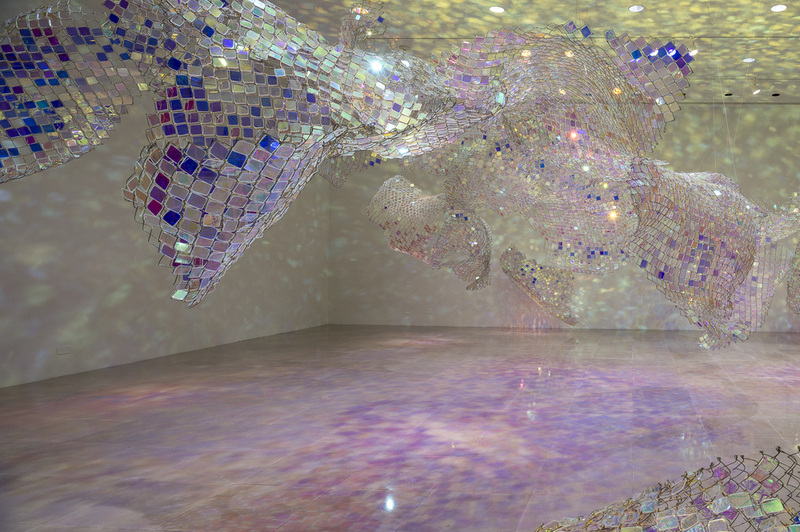 Soo Sunny Park's installation Unwoven Light animates Rice Gallery's expansive space, transforming it into a shimmering world of light, shadow, and brilliant color. Suspended from the walls and ceiling, thirty-seven individually sculpted units are arranged as a graceful, twisting flow of abstract form. Entering the gallery there is no set path to follow. Instead, we are invited to meander slowly as one might stroll along a rivers edge, stopping to admire the glints of light that dance on the waters surface. Seeing a Styrofoam cup stuck on a fence one day got Park thinking about the chain links properties of being both rigid and porous, of acting as a boundary while retaining an appearance of openness. She shapes each section of chain link by holding it in tension, bending it, and then welding each corner to hold the form in place. The shaped unit becomes a building component that she may use more than once, recycling it into new installations. For Unwoven Light, Park used twenty sculptural units from a previous installation and built seventeen new ones. Working long days with two assistants in her New Hampshire studio, it took Park two weeks to complete one unit. Each required seven hours of welding to brace the fencing, one-hundred hours of tying the wire that holds each Plexiglas piece in place, and many more hours of cutting Plexiglas shapes to fit the chain link cells. 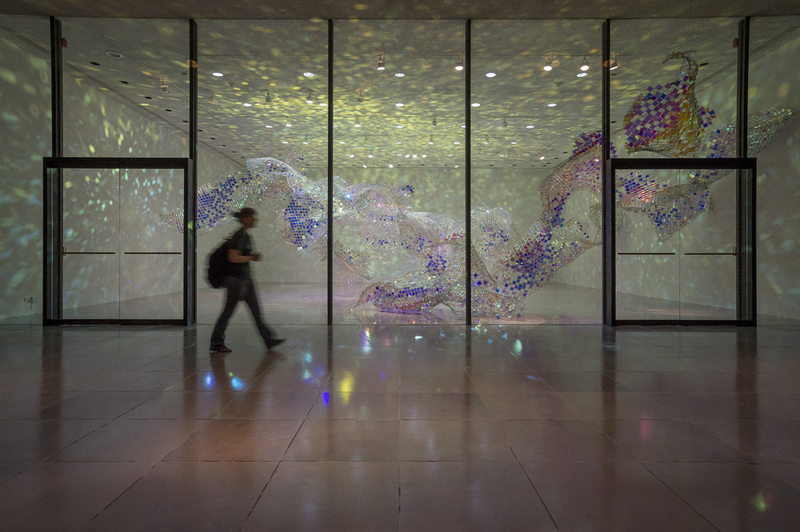 Each visitor's experience of Unwoven Light will be unique, depending upon the time of day, ratio of natural to artificial light, precise angle of viewing, and even the number of people in the gallery. It is possible for two people to stand next to one another and each have a completely different experience of the dynamic presence of light. We thank Rice University Art Gallery intern Greta Shwachman (Rice '15) for interviewing the artist and writing the first draft of this text. Born in Seoul, South Korea, Soo Sunny Park received her BFA in painting and sculpture from Columbus College of Art & Design, Columbus, Ohio and a MFA in sculpture from Cranbrook Academy of Art in Bloomfield Hills, Michigan. Park is a recipient of the Joan Mitchell Foundation MFA Grant; Grand Prize winner of the 19th Annual Michigan Fine Arts Competition; The Helen Foster Barnett Prize, National Academy Museum, New York; Skowhegan School of Painting & Sculpture residency, Skowhegan, Maine; Cité Internationale des Arts studio residency, Paris, France, and the Rockefeller Foundation Bellagio Center Arts & Literary Arts Residency, Bellagio, Italy. Her most recent installations areCapturing Resonance (2011-12)*, created with composer Spencer Topel for the deCordova Sculpture Park and Museum in Lincoln, Massachusetts, and SSVT (South Stafford, Vermont) Vapor Slide (2013/2007) at Cranbrook Art Museum, Bloomfield Hills, Michigan. Soo Sunny Park lives and works in Hanover, New Hampshire where she is Associate Professor of Studio Art atDartmouth College. 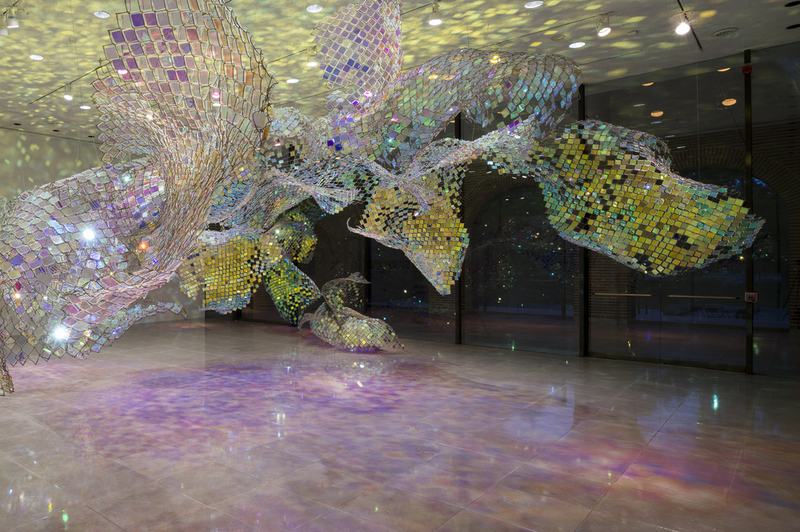 *Materials from Capturing Resonance have been incorporated into Unwoven Light. Rice Gallery thanks Lexi Lee Sullivan, Assistant Curator and deCordova Sculpture Park and Museum in Lincoln, Massachusetts.